Mote Science Education Aquarium rendering. All renderings subject to change. 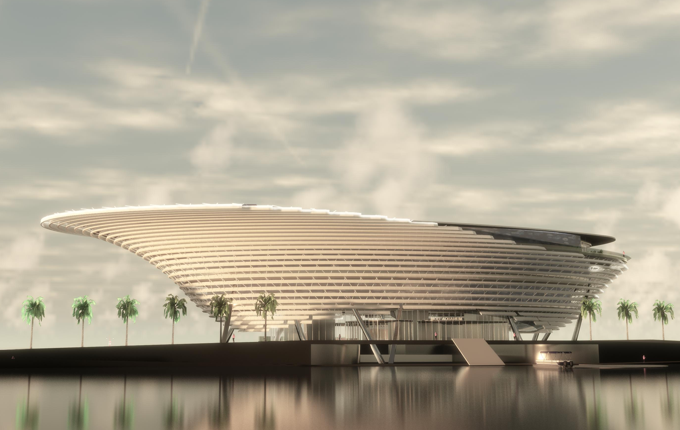 The Sarasota County Commission unanimously approved an agreement for Mote Marine Laboratory’s use of county-owned land in Nathan Benderson Park for the site of its planned new Science Education Aquarium during the county commission meeting today, Jan. 30. The “omnibus” agreement includes a two-year lease, during which Mote will pursue normal, due-diligence steps and seek zoning approval for ultimate sale of the land. If this does not happen within the short-term lease, the agreement calls for a long-term lease of 90 years. Mote Science Education Aquarium (Mote SEA) will be an iconic, educational and outreach hub that vastly improves access to marine science and technology for an estimated three million residents living within a 60-minute drive and visitors from around the world, representing a rebirth of the current Mote Aquarium. For maximum impact and accessibility, Mote leaders will establish Mote SEA on 12 acres in the Sarasota County-owned land within Nathan Benderson Park, within a rapidly growing nexus location for Sarasota and Manatee counties and the broader Southwest Florida region. Mote leaders announced their vision for Mote SEA in February 2018, and since then, discussions with county staff and other community leaders have been productive and positive. On Oct. 9, 2018, the county commission adopted a resolution supporting a partnership with Mote related to Mote SEA and directed the county administrator to return with an initial term sheet for land use. That term sheet was approved unanimously by the county commission on Oct. 24, laying the groundwork for the lease and omnibus approved today. To inform the new omnibus and future actions, independent consultant Kimley-Horn and Associates, Inc., recently completed a related analysis of needs for parking and driver access around the facility, an early step toward ensuring that Mote SEA visitors have a smooth experience entering and exiting the site. Mote SEA will be an iconic facility with 110,000 square feet containing more than 1 million gallons of exhibits featuring marine life and scientific displays from around the world, onsite diving programs, a STEM (science, technology, engineering and math) resource center for students, teachers and the general public, conference and special event space, educational galleries with interactive, advanced, digital and augmented reality technology to enhance learning, two STEM workforce training labs and three K-12 STEM teaching labs, which will offer no-cost opportunities for every school in the region. Outdoor nature trails with potential additional features such as science-education demonstrations of snook stock enhancement and wetlands restoration will enhance public use of the area. After their unanimous approval on Jan. 30, the Sarasota County Commissioners expressed excitement about Mote SEA and its anticipated benefits. Commissioner Christian Ziegler noted: “That property there is really the gateway to Sarasota County. That’s the first piece of property, if you’re coming south on I-75, that you see in our community. What better way to welcome them than with a project like this? To have Mote put their name on that and be involved with that and be located there, I think it’s really a testament to your organization and it really highlights our local community very well. The planned location in Nathan Benderson Park is visible to 45 million vehicles traveling on the nearby interstate each year, and the increasingly accessible Mote SEA is projected to serve approximately 700,000 visitors in its first year alone, double the attendance of the current Mote Aquarium. The facility will also provide sorely needed conference and major events spaces, and produce a nearly $28-million annual economic impact, beyond nearly $280 million of economic impact during the construction phase. The effort to create Mote SEA is powered by the fundraising campaign Oceans for All: Improving Access to Marine Science and Technology, which focuses on private, public and corporate giving. Learn more at moteoceansforall.org or contact Mote Oceans for All Campaign Director Michael Moore (mmoore@mote.org).